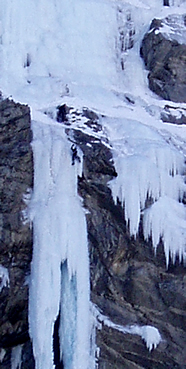 Briançonnais is one of the best regions in Europe for ice climbing. There are more than 250 waterfalls from 20 to 700 m in height which freeze each winter to create an amazing playground for the worlds ice climbers. Below we have produced a summary of what's on offer if you come to this mecca of ice. The entrance to this valley is just 10 mins drive from our apartments in Les Vigneaux village. About 30 minutes walk in from the parking area of "Salce" you will find around 50 ice routes from single pitch 25m up 700m in length. Beginners single pitch routes are available such as the grade I "Cascade du bois" and all the way up to 500m grade 5's, 6's and beyond. 20 minutes drive from Les Vigneaux gets you to the winter parking area in this massive valley. From here after approx. a 45 minute walk you will find masses of routes in the harder grades. Typical routes here are around 200-300m in length and in the grade 4-6 categories. There are a few single pitch routes too as low as grade I. A truely spectacular valley. In the later stages of winter it is quite feasible to ice-climb in the North facing side of the valley and then rock climb in shorts and T-shirt on the south facing side! The Ceillac area is relatively small compared to Fournel and Freissinières, but again it packs some great gully routes a good variety of grades from I's and II's up to M7+ and beyond. Routes are in the 50-300 m range. Following the river Romanche as it descends from La Grave to lake Chambon you will find about 70 ice routes from grade II upwards in the 200 - 300m length categories. The starts of these routes are typically about a 40 minute walk up from the road in the base of the valley. Ice Climbing Ecrins known here as the I.C.E. will be holding its event this coming year from the 9th - 13th January 2008. ICE is aimed to bring ice climbers of all levels together to discover new climbing areas, try the latest equipment for free and to see and try the latest techniques for climbing ice at all levels. Over recent years the event has attracted up to 1000 people which is testament to its fantastic organisation, facilities and of course the amazing ice on offer. We recommend the following ice climbing guide books if you are going to make a trip here. Copyright © 2005 - 2011 AlpSun.com. All Rights Reserved.